U.S. Sen. Ted Cruz, R-Texas, is aligning with President Donald Trump in highlighting the lack of evidence in recently issued indictments that Russia's government colluded with Trump's 2016 campaign to influence the election. DALLAS — U.S. Sen. Ted Cruz, R-Texas, is aligning with President Donald Trump in highlighting the lack of evidence in recently issued indictments that Russia's government colluded with Trump's 2016 campaign to influence the election. "On the face of these indictments, they say that the American side of it was unwitting — that there was not collusion. That's pretty significant," Cruz told reporters here Saturday night while emphasizing he is still waiting to see the results of congressional probes into Russia's role in the election. Those investigations, Cruz said, "need to be continued." Unveiled Friday, the indictments allege that 13 Russian nationals sought to interfere in the election and boost Trump over his Democratic opponent, Hillary Clinton. The indictments came from special counsel Robert Mueller, who is investigating whether Trump's campaign had any connection to Russian meddling in the election — an issue that has overshadowed the president's first year in office. Although the charges did not address the collusion issue and Mueller's investigation is believed to still be underway, Trump responded to the indictments by insisting they proved there was "no collusion" between his campaign and Moscow. Cruz did not offer as conclusive a view, noting the absence of collusion proof in the indictments but saying he still wants to see the outcome of the congressional probes into the matter "before assessing what exactly occurred." The indictments include multiple connections to Texas, including the allegation that the Russian nationals, posing as U.S. citizens, communicated with someone "affiliated with a Texas-based grassroots organization" to try to disrupt the election. They also allege that the Russians, in their effort to elevate Trump, targeted Cruz and a number of Trump's other primary rivals. Cruz said Saturday he was reserving judgment on that aspect of the charges. 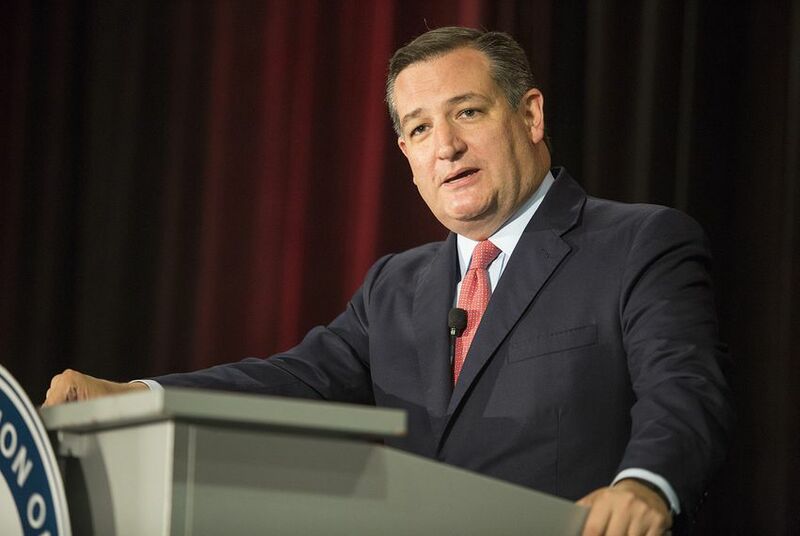 "Concerning the snippet of the indictments that mentions my campaign and that of a couple of others, I’m going to refrain from leaping to judgment until we actually see all the facts rather than just one snippet in one indictment," Cruz told reporters, after an appearance at the Dallas County GOP's Reagan Day Dinner. Trump's reaction to the indictment — which has largely focused on the collusion debate instead of the actual content of the charges — has revived questions about whether the president is taking a tough enough stance toward Russia. Asked whether the president needed to be more forceful, Cruz contrasted Trump's approach with the "eight years of weakness we had seen with Barack Obama," the Democratic former commander in chief. “I have been very encouraged by the strength and resolve demonstrated by the president," Cruz said. "I think we need to continue to show strong resolve."